More than 200 body parts from Gunther von Hagens' laboratory in Germany will be used to teach anatomy to medical students at the University of Warwick. This is the first time von Hagens' plastinated specimens have been used for teaching by a UK medical school. Warwick Medical School has spent around £400,000 on the educational specimens, which will travel to the UK this month with other specimens for von Hagens' forthcoming Body Worlds exhibition in London's O2 Arena, opening on 24 October. The funding has come from the Strategic Health Authority as part of a £1.1 million grant for the School to create a centre for excellence in anatomy and surgical skills. Dr von Hagens' plastination technique involves removing body fat and water and impregnating a polymer to preserve the body or body part. The preservation is of the highest quality, so that they can be used for medical, educational and instructional purposes. The specimens originate from body donors to von Hagen's Institute for Plastination in Guben, Germany. Warwick Medical School's Chair of Clinical Anatomy Professor Peter Abrahams said the specimens were essential for anatomy teaching. 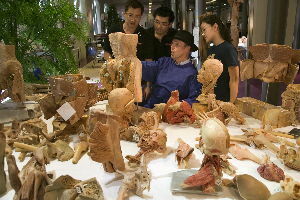 He said: "Gunther von Hagens' plastination technique is the most effective and his specimens are of the highest quality. Our students can use these specimens again and again to understand how the body works, they will be a unique and invaluable tool for the training of doctors."